Who scored hockey's greatest goal? Is it Henderson scoring for Canada in 1972? Mike Eruzione's miracle moment in 1980? Or the time Bobby Orr flew through the air? Where does Sidney Crosby's golden goal rank? How about Ovechkin's crazy goal against Phoenix. 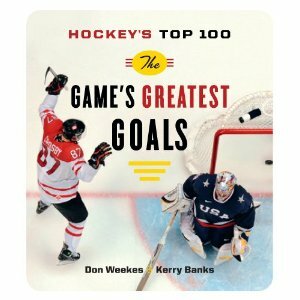 That's the focus of a the new book Hockey's Top 100: Game's Greatest Goals by two undisputed masters of sports trivia - Don Weekes and Kerry Banks. They countdown the top 100 goals in the history of hockey, from the most spectacular and most famous. I especially like how the authors start the book by defining "great." That is always a pet peeve of mine regarding these lists. It's one thing to rank the 100 greatest this or that, but failing to set the definition is a common sin. The authors define a great goal not by how flashy it was, but rather it's historical importance. Big game goals usually out rank the flashiest of goals. Such lists always make for fun debate, and Hockey's Top 100 Goals does not disappoint. I do find it interesting how international hockey dominates the very top of this particular list. The top four selections are all from the international arena. I actually probably would have moved up several spots up the list, too. I was disappointed that no women's hockey goals (hello Jayna Hefford) or junior hockey goals (pick from several from the World Junior Championship tournament alone) were included. There is no reason given for this omission. There are lots of international goals featured, and even amateur and NCAA goals, so this oversight is curious. By the way, this would make the perfect new media e-book, in theory. I could totally see reading this book with an iPad and clicking on the attached YouTube footage to enjoy the goal all over again. Not that an e-book is available for this particular title, and not that it likely would be presented that way anytime soon. Here's more from the publisher, Greystone. 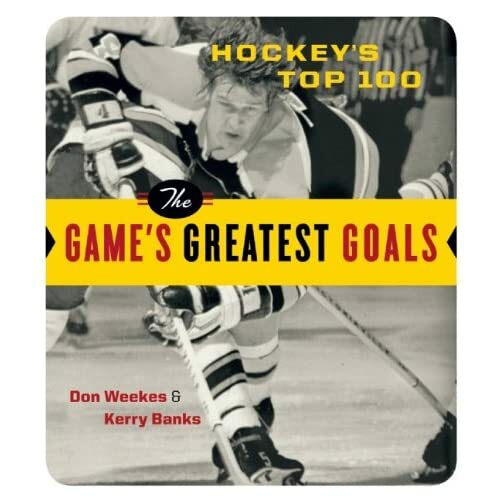 "Bestselling authors Don Weekes and Kerry Banks reviewed thousands of goals to come up with their top-100 list of the most skillful shots, game-changing moments, and rink-rocking net-bulgers of all time. Relive the game’s most dramatic highlights, including Alexander Ovechkin’s acrobatic back-slider against Phoenix in 2006, Bobby Orr’s stunning airborne Stanley Cup winner against St. Louis in 1970, Sweden’s Peter Forsberg’s magnificent gold-medal shootout victory against Canada in 1994, and Rocket Richard’s dazzling record-breaker in 1952. And who could forget Sidney Crosby’s overtime goal at the Vancouver 2010 Winter Olympics, securing Canada’s fourteenth gold medal of the Games? "With dramatic photographs throughout, The Game’s Greatest Goals is sure to spark debate among hockey fans everywhere".